Problem: Despite your team’s efforts, it looks like you’re not quite going to reach your goals for the year. You know that part of the problem is the economy, but you’ve seen other organizations thrive under the same conditions, so you know you can’t blame it all on that. You want to make sure that you finish stronger in 2012, but you’re not sure how to make that happen. Go to your potential customers. If your organization has been relying on the same marketing methods for years, be the manager who moves it forward. Offer to take the lead on a social media project by creating—and maintaining—an active Twitter, Facebook and/or LinkedIn account for your organization. Research which mediums are most popular among your customers and focus your efforts there. Another option: Attend industry events where you can network and meet potential customers. Pay attention to what others are doing. Observe what competitors, industry leaders and other local organizations are doing. Visit their websites and brick-and-mortar stores to see what changes they’ve made. Sign up for their newsletters. Check their Facebook pages. Follow their Twitter accounts. You’ll be rewarded with a plethora of insight about what’s working—or not working—for everyone else. Studying top-notch organizations, whether they’re in your field or not, can be hugely beneficial too. Best-selling author Joseph Michelli will be leading a live audio conference on Jan. 5, titled “Using ‘The Zappos Experience’ to Create an Engaging, Inspiring Workplace Culture.” It’s a great opportunity to learn the secrets of a very successful organization, so you can apply those lessons at your workplace. Re-evaluate your rewards system. Numerous studies have shown that traditional methods of motivation—the “carrot and stick” methods—aren’t the most effective for today’s workers. Instead of bribing your employees with trophies and bonuses, reward them with extra autonomy. By giving your employees more freedom over their work, they’ll be more creative and committed to their assignments. Better yet: Ask your employees directly what motivates them. You may be surprised by how simple their requests are. 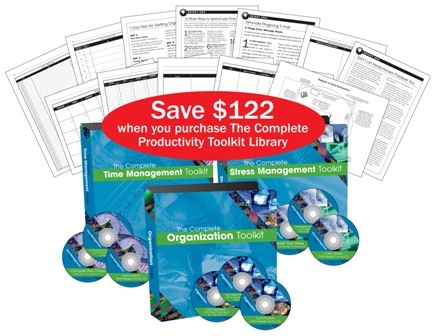 There are three toolkits that will help you and your staff gain 60 minutes of time each day, get better organized in only one hour per day for seven days, and deal effectively with the people causing your workplace stress. The Complete Time Management Toolkit. The Complete Stress Management Toolkit. This two-day workshop will help you navigate the difficult transition from peer to supervisor, avoiding the most common mistakes new managers make! Jan. 26-27: San Diego, CA. Jan. 30-31: Hilton Head, SC. Click here to receive Bud to Boss: Take 5 once a month, delivered straight to your inbox! This entry was posted in Bud to Boss Take 5 and tagged Leadership, Management, motivation, training. Bookmark the permalink.